That afternoon we planned to visit Nalsarovar Bird sanctuary. When we were just passing by Becharaji, we got call from our friend from LRK. He informed us there are good number of Macqueen Bustard visible in LRK, and advise to visit that place as soon as possible. We dropout our plan for Nalsarovar and start our drive towards LRK. We saw around 6-8 MacQueen's Bustard. While we started our return journey, we chase a Desert Hare and take ground level shots of several Sandgrouse .Finally it is too late we were unable to do any more photography because of low light. 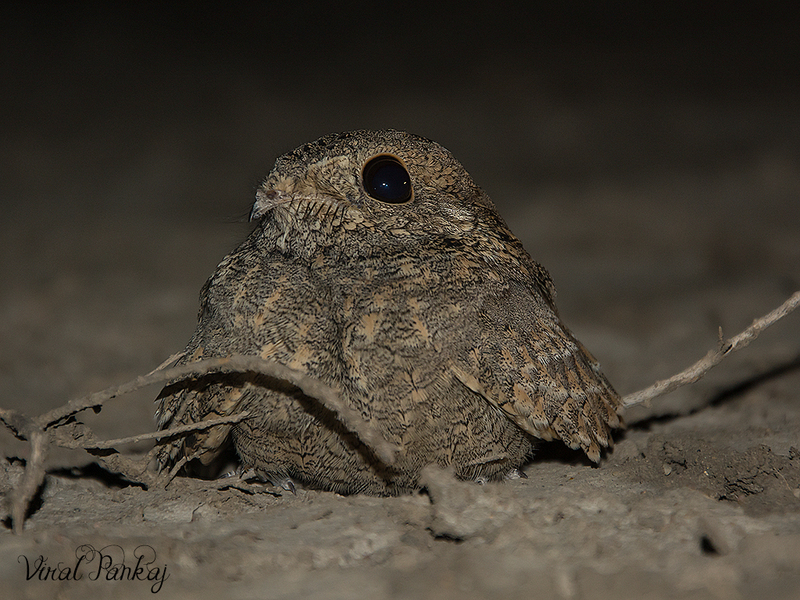 And it was just late enough to get Nightjar roosting on road. We can only able to spot Nightjar due to bright reflective eye-shine in the spot of our vehicle’s headlights. We confused many time between eye-shine of spider and Nightjar. After that we came to know that eye-shine of spider is sliver while red in nightjar. It was Sykes's Nightjar. Sykes's Nightjar is winter migrant in Gujarat, also known as Sindh Nightjar. It was very friendly, allow us to come real close. May be overconfident in its own extreme camouflage, its lies still on the ground and never flinch even an inch…! Then we locate one small Desert Fox foraging into the ground using sense of hearing and smell. When Desert Fox found something it was settled between two bushes and unexpectedly three nightjars appear. They were literally driving away the Desert Fox. In seconds both species nowhere to be found. Afterwards we saw some another nightjars flies from the road with an easy, moth-like flight. We can only able to see eye-shine and hear fluttering of wings. This was of one of the unforgettable day of our life as we saw two new species which are very shy and difficult to locate.